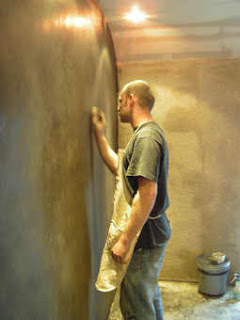 I started my career as a plasterer as a skinny 16-year-old apprentice - I wasn't the usual candidate for a livelihood in construction, being the slightly nerdy type. I still remember my first day on a job site - my plastering mentors might have been amazing craftsmen but their interpersonal skills needed a little, er, tweaking. So as you can imagine, I had to learn fast. But despite this, one thing that stands out about those guys back then was that they took their craft very, very seriously. Every day they wore spotless white overalls - there wasn't a pair of Umbro tracksuit bottoms in sight. Their trowels were gleaming. Dodgy workmanship or corner-cutting just would not fly. They had a distinct air of arrogance, they were that good. I really admired them. Bankart's "The Art of the Plasterer"
Van den Branden and Knowles' "Plastering Skill and Practice"
...It was from reading these books that my interest in coloured and polished lime plaster finishes developed. 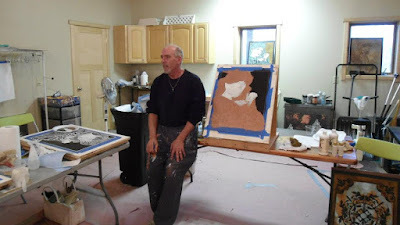 Initially, I started with scagliola, where virtually any type of marble can be imitated using gypsum plaster, oxide and earth pigments, and glue. So I did some experimenting with both traditional scagliola and marazzo scagliola. But at that time, there was absolutely no demand for this sort of work in Northern Ireland, so it was purely as an interest. By this time I'd been self-employed for a few years and my work consisted of bog-standard plasterwork, which I did well, but didn't find it inspiring. The most I could hope for was some moulding and modelling work. Then one night I was watching TV and happened to tune into a programme that very briefly mentioned Italian marmorino. It was a true Damascene moment. I was transfixed! I made it my raison d'être to find out more. Up to that point, I had thought that the last place marmorino had been used was probably Pompeii, but now it appeared that there were architects who had rediscovered its possibilities. My initial plan was to buy the raw materials and make my own marmorino using recipes from the old books, but then I realised that it would be tricky to source suitable lime putty locally and it would be easier to just buy the marmorino ready-made. The first importers I dealt with insisted that I would have to take one of their training courses before they would sell me material. More on that in a later post, I think. So after a two-day training course, I returned to Belfast realising that I had found my niche in life. After that, a flurry of activity ensued. Trips to Italy. Endless hours spent in the workshop in the pursuit of new and better techniques and learning how to work with earth and oxide pigments. As I found out about new materials I trained to use them as well, for example Moroccan tadelakt and Japanese shikkui. The books I read started to change too. A friend lent me "Vasari on Technique" (must return that some time) and I built up a library on modern architecture. I also subscribed to idFX and other magazines for design professionals. I did more research and found out about the European School for Craft Conservation on San Servalo island, Venice. ...Then we had a few good breaks. By accident, I was put in contact with a couple of amazing architects from Dublin and we've had a great working relationship ever since. My first job for them was a marmorino exterior. The design of the house (their work) was ultra contemporary, but it was how they reacted to my samples on our initial meeting that encouraged me most of all. 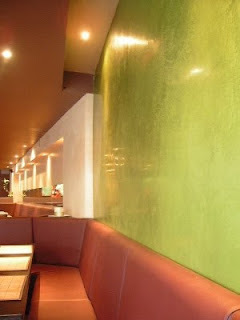 Before that, I had been visiting local architects, showing them our finishes, and getting blank stares. Now someone actually seemed to "get" what we were doing and showed enthusiasm about it. So I realised at this point that our efforts would need to be concentrated slightly further afield, and since then we haven't looked back.